Tablut is perhaps the best documented version of these types of games. In 1732, Carolus Linnaeus recorded the rules and a drawing of the board in his journal while travelling through the area. It is played on a 9x9 board. 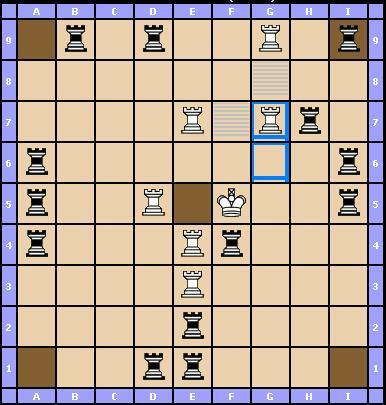 All pieces (including the king) can move horizontally or vertically any number of spaces (like a chess rook). They cannot move into a space occupied by any piece, friendly or hostile. According to the version you play on the site, certain rules apply. Version 1 : No pieces can move onto the center square. Version 2 and 3 : No pieces can move onto the center square. Besides, the rook cannot move on the 4 corners. 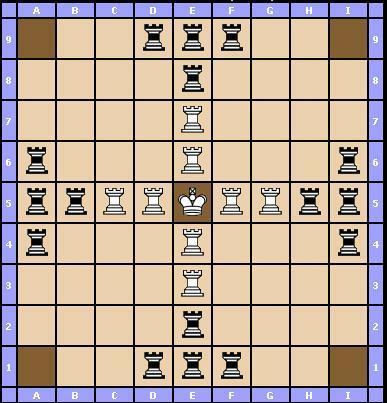 In version 1 , the king cannot participate in captures, in version 2, and 3, the king can capture if he's the moving piece. but you can capture in multiple directions at once (theoretically, up to 4 pieces at once). An enemy piece can move between two of your pieces and not be captured. You only capture pieces when you surround an enemy piece on that turn. The image below shows how white captures 2 black rooks by playing g6 to g7. ATTENTION, in version 3, the 4 corners are called hostile. It means you can use them as it it were one of your pieces to capture an opponent piece.